Pakistan's employment growth has been the highest in South Asia region since 2000, followed by Nepal, Bangladesh, India, and Sri Lanka in that order, according to a recent World Bank report titled "More and Better Jobs in South Asia". 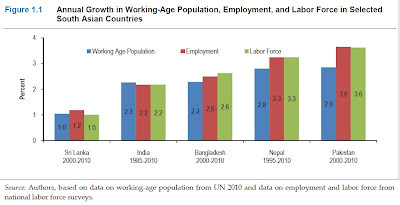 Total employment in South Asia (excluding Afghanistan and Bhutan) rose from 473 million in 2000 to 568 million in 2010, creating an average of just under 800,000 new jobs a month. In all countries except Maldives and Sri Lanka, the largest share of the employed are the low‐end self-employed. The report says that nearly a third of workers in India and a fifth of workers in Bangladesh and Pakistan are casual laborers. Regular wage and salaried workers represent a fifth or less of total employment. 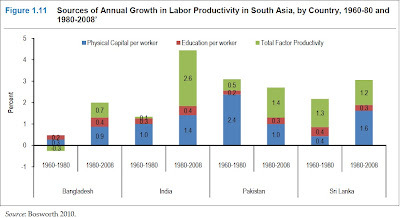 Analysis of the labor productivity data indicates that growth in TFP (total factor productivity) made a larger relative contribution to the growth of aggregate labor productivity in South Asia during 1980–2008 than did physical and human capital accumulation. In fact, the contribution of TFP growth was higher than in the high‐performing East Asian economies excluding China. India's labor productivity growth since 1980 has been the highest in South Asia, followed by Sri Lanka and Pakistan. This was particularly the case in India where TFP rose by 2.6% versus 1.4% in Pakistan during this period. The report argues that South Asia region needs to create a million jobs a month just to keep up with the growth of the workforce. In addition to corruption, conflicts and political instability, the report specifically mentions electricity shortage as a key factor inhibiting job growth in the region. Power sector financial losses across the region are large, resulting from the misalignment of tariffs, the high cost of power procurement, and high transmission and distribution losses. In India the combined cash loss of state-owned distribution companies is more than $20 billion a year, compared with $300 billion of investment needs in 2010–15. The sector deficit in Pakistan is estimated at about $2 billion a year, compared with $32 billion of investment needs in 2010–20. It's important for Pakistani government to seriously address the energy and security crises to restore investor confidence and bring back the strong economic growth necessary for creating millions of jobs for its growing youth population entering the workforce. The consequences of inaction on this front would be far more disastrous than the negative effects of the current Taliban insurgency. Unfortunately, cross-country analysis of the connections between manufacturing employment and levels of development has been restricted to OECD countries. This matters because many developing country governments have large programs to stimulate manufacturing activity, on the understanding that jobs and higher incomes will follow. Ambitious job targets are announced - such as 100 million new manufacturing jobs by 2022 in India. These are typically justified with reference to the experiences of earlier industrializers, like Korea and Taiwan. Public budgets, land and labor regulations, and even education policy are being modified to pursue these manufacturing jobs. We can see why developing countries want these manufacturing jobs: our data show that a country’s peak manufacturing employment share between 1970 and 2010 rather than is its peak manufacturing output share, is a much better predictor of its average per capita GDP in 2005-2010. Controlling for peak manufacturing employment shares and the date that manufacturing activity peaked, peak output shares are insignificant predictors of subsequent prosperity. This suggests that manufacturing output matters for prosperity only insofar as it comes with jobs. Moreover, we show that every country that is rich today, by any reasonable standard, had more than an 18-20% manufacturing employment share sometime since 1970. It is important to note that industrial activity typically grows with income in poorer countries, peaks, and then falls with income and wages in richer (deindustrializing) countries. There are two reasons we think that manufacturing employment-led development is becoming more challenging. Labor productivity has risen faster in manufacturing than in the wider economy. Higher levels of manufacturing output are now compatible with lower levels of manufacturing employment. They’re (jobs) being obliterated by technology. Check out your groceries or drugstore purchases using a kiosk? A worker behind a cash register used to do that. Buy clothes without visiting a store? You’ve taken work from a salesman. Book your vacation using an online program? You’ve helped lay off a travel agent — perhaps one at American Express Co., which announced this month that it plans to cut 5,400 jobs, mainly in its travel business, as more of its customers shift to online portals to plan trips. Software is picking out worrisome blots in medical scans, running trains without conductors, analyzing Twitter traffic to tell where to sell certain snacks, sifting through documents for evidence in court cases, recording power usage beamed from digital utility meters at millions of homes, and sorting returned library books. Year after year, the software that runs computers and an array of other devices becomes more capable of doing tasks that humans have always done. For decades, science fiction warned of a future when we would be architects of our own obsolescence, replaced by our machines; an Associated Press analysis finds that the future has arrived. The global economy is being reshaped by machines that generate and analyze vast amounts of data; by devices such as smartphones and tablet computers that let people work just about anywhere, even when they’re on the move; by smarter, nimbler robots; and by services that let businesses rent computing power when they need it, instead of installing expensive equipment and hiring IT staffs to run it. Whole employment categories, from secretaries to travel agents, are disappearing. The numbers startle even labor economists. In the United States, half of the 7.5 million jobs lost during the Great Recession paid middle-class wages, ranging from $38,000 to $68,000. But only 2 percent of the 3.5 million jobs gained since the recession ended in June 2009 are midpay. Nearly 70 percent are low-paying jobs; 29 percent pay well. In the 17 European countries that use the euro as their currency, the numbers are even worse. Almost 4.3 million low-pay jobs have been gained since mid-2009, but the loss of midpay jobs has never stopped. A total of 7.6 million disappeared from January 2008 through last June. Some occupations are beneficiaries of the march of technology, such as software engineers and app designers. But, overall, technology is eliminating far more jobs than it is creating. To better understand the impact of technology on jobs, The Associated Press analyzed employment data from 20 countries; and interviewed economists, technology experts, robot manufacturers, software developers, CEOs, and workers who are competing with smarter machines. ■ Over the past 50 years, technology has drastically reduced the number of jobs in manufacturing. Robots and other machines controlled by computer programs work faster and make fewer mistakes than humans. Now, that same efficiency is being unleashed in the service economy. ■ Technology is being adopted by every kind of organization that employs people — in large corporations and small businesses, established companies and startups, schools, hospitals, nonprofits and the military. HUMAN hands are extremely good at making clothes. While many manufacturing processes have been automated, stitching together garments remains a job for millions of people around the world. As with most labour-intensive tasks, much of the work has migrated to low-wage countries, especially in Asia. Factory conditions can be gruelling. As nations develop and wages rise, the trade moves on to the next cheapest location: from China, to Bangladesh and, now that it is opening up, Myanmar. Could that migration be about to end with the development of a robotic sewing machine? There have been many attempts to automate sewing. Some processes can now be carried out autonomously: the cutting of fabric, for instance, and sometimes sewing buttons or pockets. But it is devilishly difficult to make a machine in which fabric goes in one end and finished garments, such as jeans and T-shirts, come out the other. The particularly tricky bit is stitching two pieces of material together. This involves aligning the material correctly to the sewing head, feeding it through and constantly adjusting the fabric to prevent it slipping and buckling, while all the time keeping the stitches neat and the thread at the right tension. Nimble fingers invariably prove better at this than cogs, wheels and servo motors. “The distortion of the fabric is no longer an issue. That’s what prevented automatic sewing in the past,” says Steve Dickerson, the founder of SoftWear Automation, a textile-equipment manufacturer based in Atlanta, where Dr Dickerson was a professor at the Georgia Institute of Technology. The company is developing machines which tackle the problems of automated sewing in a number of ways. They use cameras linked to a computer to track the stitching. Researchers have tried using machine vision before, for instance by having cameras detect the edge of a piece of fabric to work out where to stitch. The Atlanta team, however, have greatly increased accuracy by using high-speed photography to capture up to 1,000 frames per second. These images are then manipulated by software to produce a higher level of contrast. This more vivid image allows the computer to pick out individual threads in the fabric. Instead of measuring the fabric the robotic sewing machine counts the number of threads to determine the stitching position. As a consequence, any distortion to the fabric made by each punch of the needle can be measured extremely accurately. These measurements also allow the “feed dog”, which gently pulls fabric through the machine, to make constant tiny adjustments to keep things smooth and even. Shoemakers are already using 3D printers, which build up material additively, to make prototypes of shoes. Exotic clothing and shoes made with 3D printers are becoming regulars on the catwalks at many of the world’s leading fashion shows, although the materials they are printed from tend to be various sorts of plastic, which can make the garments somewhat clunky and shoes a bit clog-like. However, researchers are working on ways to print more flexible materials. One such project involves a collaboration between Disney, Cornell University and Carnegie Mellon University. Their 3D printer uses layers of off-the-shelf fabric to make soft objects, such as cuddly toys. In the global jobs picture, India stands out as even more of a sore thumb. The worldwide unemployment rate, as calculated by JP Morgan research, is almost back to its pre-2008 crisis low of 5.5 per cent. Developed economies from the UK to Japan have the lowest unemployment rates seen in many decades. In emerging economies, the unemployment rate has been falling since 2014 and this year even countries such as Russia and Brazil, which experienced deep recessions, are seeing a marked improvement in the labour market. In India, meanwhile poor quality data makes it difficult to put a number on the job woes, but the available data is grim and news stories about jobs losses abound. The best explanation lies in recent domestic policy moves, as until last year both India and emerging markets broadly were slowing down in sync. A disconnect began late last year when growth in emerging markets started recovering and India kept slowing. The first of the policy moves was the unique demonetisation experiment. The second was the Goods and Services Tax, which was supposed to bring India in line with global standards but instead added typically Indian layers of complexity. These policies disrupted local businesses, including exporters. Imports have surged to meet consumer demand, widening the trade deficit and cutting into GDP growth. It is disappointing that India is missing out on the global revival in economic growth, but perhaps even more troubling that it is missing out on jobs growth – a trend that precedes the GDP slowdown but has also gotten worse over the past year. Many commentators are blaming these troubles on global forces. In India, especially, it is popular to talk about how automation is taking jobs away from humans. But the global jobs boom suggests that there is little evidence for such losses. At any point in time technology is destroying some traditional jobs, and creating them in new industries. India’s apologists also point to “premature deindustrialisation”, the idea that it is increasingly difficult for countries to export their way to prosperity, because of a more competitive environment for manufacturing globally and slumping world trade. Even though trade volumes have perked up this year, they are well below the pace seen before 2008. And competing in global manufacturing, which was always the most important path to mass employment, is harder now following the rise of China. Japan signed a commitment Monday to provide $3.9 million to the United Nations Development Program in Pakistan for an initiative aimed at generating nearly 20,000 jobs for youth in the provinces of Sindh and Khyber Pakhtunkhwa. The agreement, signed by Japanese Ambassador Takashi Kurai and UNDP Country Director Ignacio Artaza at a ceremony in Islamabad, covers funding to help set up 50 community centers in the two provinces. The centers will provide vocational training, particularly in information technology, to young people to prepare them for self-employment or employment in different vocations. "Japan will continue to support youth and young women so that they can take the lead in development of the country, which has bright future with young population," Kurai said in his speech. Pakistan has a population of 207 million, with 31 percent between 15 and 29 years, and a youth unemployment rate of over 10 percent. "It is crucial to invest in this 'youth bulge' and provide young people with the skills and knowledge they need to operate in an increasingly competitive employment market, and to help Pakistan's youthful population to contribute in its sustainable development," the Japanese Embassy said in a statement. Khyber Pakhtunkhwa and adjacent tribal areas bordering Afghanistan have been dubbed as nursing grounds for terrorism, with officials and studies often attributed this to lack of employment opportunities and poverty. The Inter­na­tional Labour Organisa­tion (ILO) has warned that Asia-Pacific still faces structural weaknesses in its labour markets despite two decades of economic growth. In its ‘Asia-Pacific Employ­ment’ and ‘Social Outlook 2018’, released on Friday, ILO pointed out that although the regional unemployment rate is projected to remain 4.1 per cent through 2020, the vulnerable employment rate is expect to creep up towards 49pc, reversing a downward trend of at least two decades. The region’s future prospects will require that economic growth go hand in hand with a further expansion of decent work, it says. While real wage growth surpassed labour productivity growth between 2010 and 2016 in almost all countries, the increase in wages of employees looked especially strong in China, Thailand and Vietnam. However, negative wage growth was witnessed in Pakis­tan in 2015-16 at minus 4.7pc. In Pakistan’s education sector, 6.6pc of the total female employment in 2016 was well behind the 72.9pc share in agriculture and 12.7pc in manufacturing. Pakistan stands out with 15.3pc of women working from their homes, and 37pc working on the land (in agriculture) in 2017. Structural transformation has been strongly felt in the region, with employment moving from agriculture mainly into services and only to some extent into industry. Most of the loss in agriculture was taken up by the increase in employment in the services sector, where 740 million jobs have been gained since 2000. Manufacturing jobs dec­rea­sed slightly from the peak in the mid-2000s, with more job losses accruing to women than men. The report says while the Asia-Pacific region has made rapid progress to substantially reduce extreme poverty, one fourth of all workers in the region — 446m workers — still lived in moderate or extreme poverty in 2017 and nearly half of the workforce — 930m people — were still making a living in vulnerable employment as own-account or unpaid contributing family workers. With 1.9bn workers — 1.2bn men and 700m women, the Asia-Pacific region represented 60pc of the global workforce in 2017. 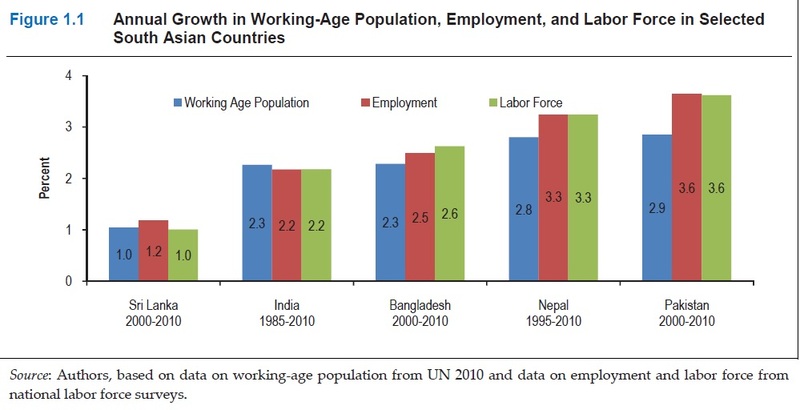 Asia and the Pacific has the most people working, relative to the working-age population. Employment-to-population ratio stands at 59.7pc, compared with 58.6pc at the global level. Large numbers of workers in the region, especially those in low-paid jobs, work more than 48 hours per week. The average hours worked in Southern Asia and Eastern Asia in 2017 were the world’s highest, at 46.4 and 46.3 hours per week, respectively. In Eastern Asia, almost one in five workers worked in excess of 60 hours per week. The regional unemployment rate at 4.1pc is the world’s lowest and well below the global rate of 5.5pc in 2017. But while the global unemployment rate has held steady since 2015, the rate in the Asia-Pacific region has increased slightly by 0.1 percentage point. In total there were 80.9m unemployed persons in Asia and the Pacific in 2018. At 10.4pc, unemployment rate among youth remained unchanged from 2015, while the global rate increased to 12.6pc. Thirty five per cent of the region’s unemployed were youth (aged 15—24), although youth made up only 20pc of the working-age population. In general terms, the labour market gains evident in the Asia-Pacific region in the past few years remain present but fragile. Decent work deficits persist in all countries in the region and continue to weigh heavily on development trajectories. Over the coming years, economic growth is expected to remain strong in the region, with growth rates of 5.6pc expected for 2018 and 2019, compared with 3.9pc at the global level. The country’s unemployment ratio stood around 5.8 percent in the country, according to a survey of Pakistan Bureau of Statistics (PBS) on labor force 2017-18. While the ratio of male unemployment stood at 5.1 percent, unemployment ratio in female stood at 8.3 percent. As per the data released by PBS, agriculture sector provided 38 percent of employment in FY17-18, less than the 42 percent it was providing five years ago. Industrial sector provided 23.7 percent of jobs in the said period, whereas the ratio was 22.6 percent five years back. Furthermore, literacy rate in country stood around 62.2 percent, with literacy rate for male at 71.6 percent and female at 51.8 percent.